In the village of Fatai, Tonga, Soana Ta’ake was born on 6 July 1940, the second of the eight children of Penitoa and Malia Fatai Finau. Two of her siblings died as infants. From her youth she was a very outgoing person with a beaming smile. This and her infectious laugh put people at ease. Her joy and simplicity showed throughout her life especially when on the many occasions she spontaneously stood up with a big smile to dance. 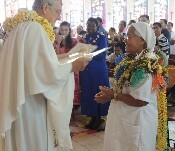 Drawn to religious life from the age of 16, she was 24 when received as an smsm novice, the only Polynesian in that particular entrance group of eleven. Like her chosen patroness, St Margaret Mary Alacoque, she had a great love for the Sacred Heart. Before she entered Heretaunga, Soana lived with the Duncan family next door to the novitiate to help her adapt to life in a different country. 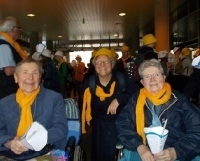 During these months she attended classes at Sacred Heart College, Lower Hutt. 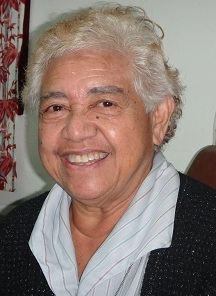 Skilled in sewing and embroidery - like many Tongans of the time – she spent much of her novitiate in the sewing room where, after her profession on 8 September 1966, she continued to share as a staff member until she returned to Tonga. She loved teaching little ones, especially about the Catholic faith, and teaching became Makalita’s principal apostolate in early years. 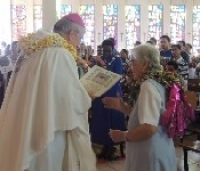 She taught at St Theresa’s Primary School in Houma, at St Bernadette’s School on the island of Niua Toputapu where she made her final profession, and at the Ma’ufanga St Mary’s Technical School (now ‘Ahopanilolo Technical College). In 1977 she studied at the South Pacific Commission in Suva. A practical woman, she willingly shared the gifts of her hands with the women. Makalita was always ready and happy to teach people whatever she knew, and constantly sought new knowledge and skills to share with others. There was a change in apostolate for Malia Makalita after studies at Chanel Institute, Auckland (1976), and at the East Asian Pastoral Institute in Manila (1981-82). She returned to Tonga which she found different in that both her parents had died while she was in the Philippines, and her new ministry was as a member of the diocesan Education in Christian Living team (ECL) with its focus on building Christians who are strong in faith and action. As always, she was ready to be involved with a positive and joyful spirit. She participated in the 1985 LTSR in Rome, thoroughly enjoying the whole experience but in particular the special audience with Pope John Paul II. At the time for the official photos, Makalita was still laughing and trying to take pictures, so the sisters called her attention and even the Pope called out: “Yes, Makalita, the Pope’s waiting.” In the photo she is kneeling in front of the Pope who has his hand on her head. Yet another change of direction came for her after LTSR: mission to Latin America. She set out for Peru in November 1986 then on to Bogota, Colombia. Joyfully embracing the cultures of the ‘other’, she was open to learn from them. Sister never really mastered Spanish, but did not let that stop her being among the people and speaking through the language of the heart. Her gift of understanding and wisdom are treasured by those who knew her. 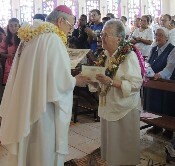 When the women of the community of St Martin de Porres (Parish of San Benito) heard that Sister had died, they wrote of the significant memories she left behind. 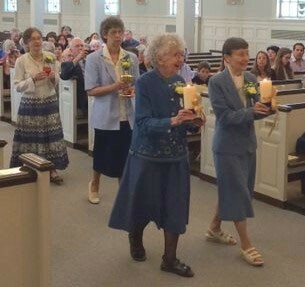 They remember her as forming the liturgy team, helping the laity participate in their Eucharistic celebrations. She organized a team of catechists to prepare the Sunday School children for the sacraments of initiation, and she took the Word of God and Communion to the sick. “What she taught us still continues today with even greater scope. Her motto was that we had to be prepared to face any eventuality that may occur if someday our sisters were not with us we would always continue with these activities. … Hermana Makalita, we will remember you forever with much love and gratitude because we were taught and prepared to succeed in any circumstance.” At this time Sister was living in the formation house community in Las Flores. In 1997 she returned to Tonga as Director of the ECL team for six years. Throughout her life she was a bridge builder and a peace maker in many difficult situations in parish groups and broken families. She was a great support to priests (especially those foreign to the country) who were having a difficult time in their ministry. Always ready and available to accept whatever service the Congregation asked of her, including those of Sector co-ordinator or community leader, she was a joyful member of the novitiate staff when appointed to St Anne’s in Auckland (2004 – 2008). On her return to Tonga after the New Life Programme in Sydney in 2009 her health was not good for a time. When she was stronger she again helped with the ECL programme. Richly experienced in ministries, and with a special place in her heart for the poor and unfortunate, she loved to serve children, young people and older folk. Like her mother and model, Mary, her song was truly: My soul proclaims the greatness of the Lord, and my spirit finds joy in God my saviour (Lk 2:46). Recently Malia Makalita has suffered from heart problems. In late September she was admitted to Vaiola Hospital where God called her to fullness of life in the afternoon of Thursday 27 September 2018. 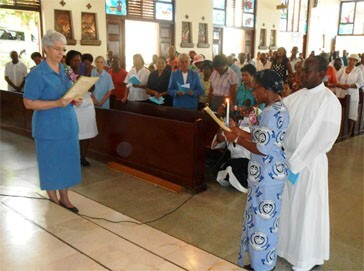 Her requiem Mass was celebrated in the Ma’ufanga Cathedral of Mary Immaculate, on 3 October before she was buried in the company of many sisters, missionaries and laity in Kalevalio cemetery. in the Spirit of Mary.